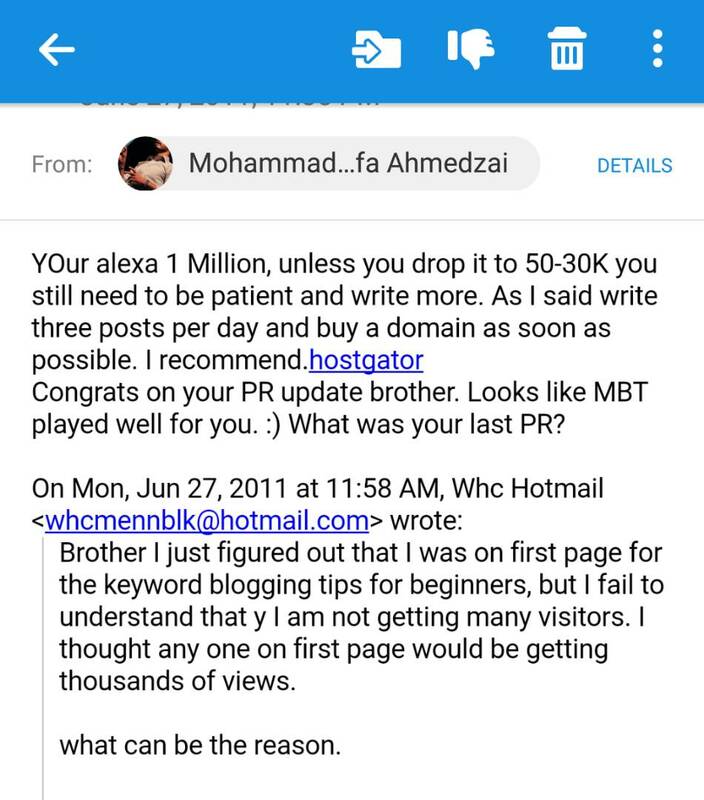 Having profound mentors in your life could really make or break your dreams and I can't be more grateful to Allah Almighty that brother +Mohammad Mustafa Ahmedzai of Mybloggertricks was one of the first mentors I had in my blogging career. A person who would share everything he learned on the way so transparently just like brothers which is why he is with in the hearts of many within and across the country, all along the globe. 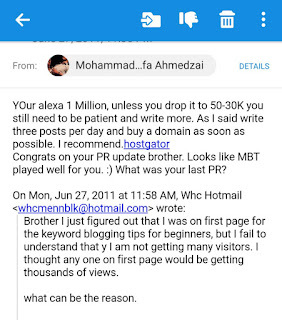 Just recently, I was going through my email inbox and found my conversation with brother Mustafa back in 2011 where I was seeking his guidance on blogging. Interestingly, I loved seeing my questions from him and that is exactly what made me believe that everyone starts from scratch. Before I share, I would like to share that this post directly comes from with in my heart and what I believe about setting and achieving goals in life. If you're thirsty for some motivation, make sure you end up reading it all. If you're a beginner and you believe that your questions are dumb, make sure that you know that everyone starts from zero. What ever questions that you'd have are totally normal and common among the beginners all around the world. What's amazing is that you're thinking and that is what will make you go far ahead InshaAllah. Below is a screenshot of what I asked brother Mustafa Ahmedzai back in 2011, before I'll share his wise reply after that. Notice what I asked him. My concern was that even though I got ranked for a keyword on the first page of Google, still I was not getting any decent traffic. Barely few hundred visitors. Little that I knew that the keyword I was ranking for was not really popular and didn't had to offer much in terms of traffic, all alone. I thought that ranking for keyword was all the best I could do and it should pay back the results in the form of millions of readers towards my blog. Though that wasn't that case at all. What opened my eyes was the reply from brother Mustafa. He mentioned that my Alexa rank was really poor (in millions) and if I could drop it down to below 50k world wide, then I would start seeing appreciable results. ##check## Does Alexa Rank hold any real value? Alexa rank doesn't show how successful your blog or a website is. Now that being said, it gives you an idea of (rough) of how 'running' your blog is. Some niche are able to improve their Alexa with considerable low traffic while others might have a poor Alexa apparently would actually be enjoying millions of readers. Though have a better Alexa rank means that your blog is towards the rise and you're heading in the right direction. Gradually your blog is improving and readers are coming by. Its easy to manipulate Alexa rank, though through a wider perspective, its a good metric to aim for. As a beginner, it's a great advise to give to someone to improve your Alexa rank. Why? Because that person would then aim to improve his blog's publishing frequency, and then helping his blog to grow overall. The core and the gist of the advise was to 'increase' posting frequency of the content that is worth reading and sharing. I hope this little share gave you motivation that we all get to start from zero. What matters is how 'frequently' we get to share 'quality' content with our readers.